Cyclocross is a form of off-road racing done on laps of a parkland circuit that usually includes a mixture of terrain and obstacles, both man made and natural. Cyclocross racing is very accessible, and local events can be ridden on any bike with no previous experience. Cyclocross is open to all ages, with categories ranging from under 8s through to over 70s. 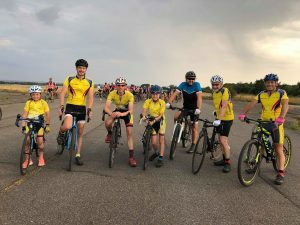 The traditional cyclocross season runs from September to January, but there’s also a number of local series that run on weekday evenings in the summer. Oxonian is affiliated to Wessex Cyclocross and organises a round of this league each year. Club members also race in some Western CX and Central CX league events, as well as the Banjo Cycles (Newbury) and Take 3 Tri (Abingdon) summer series. Oxonian CC is hosting round four of the Wessex CX league at Standlake on 7th October 2018.